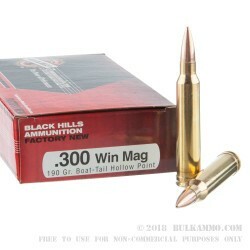 Long-range competitive shooters will appreciate the unerring precision of this .300 Winchester Magnum load from Black Hills. 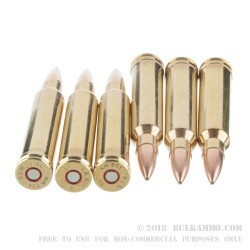 These cartridges may not be the cheapest around, but they'll always deliver the accuracy you need when a trophy is on the line! 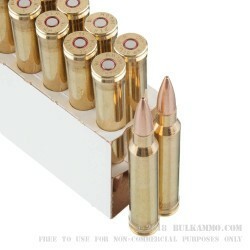 Each cartridge in this 20-round box fires a heavy 190 grain hollow point boat tailed match bullet at 2,950 feet per second. Expect flat trajectories and excellent stability even in the presence of crosswinds. Black Hills ammunition is loaded in Rapid City, South Dakota using non-corrosive primers and brass cases.